Adjacent to Gifu Prefecture Ceramic Museum. Recommended beginner's workshop for those who want to build a foundation in the craft. You get to try various aspects of pottery, such as the potter's wheel, handwork, mold release, etc. It takes about a month to complete your work. Ceramics class taught by experts Masahiro Wakao and Keisuke Wakao. One week, or up to one month courses with lodging in Tajimi are available. 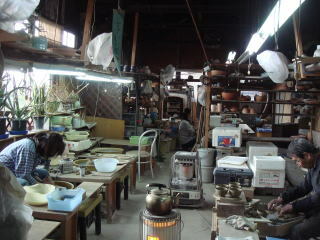 ​Our ceramics classroom is attached to a pottery equipment specialty shop. We have over 50 types of glaze to choose from. Possible to visit without reservation on the day. Friendly and supportive staff. We can handle large groups of 10 to 200 people. We offer a pottery experience where you can use a "Kobe-Gama kiln", an open kiln with a two hundred year history. In addition to pottery, you may try hand-knotting and painting. Five member courses are also available. Once a month Mr. Kobe Kato the 7th serves as instructor. Beginners are welcome. We provide classes in the large facility "Ceramic Park" with museums and restaurants. Young ceramics artists instruct our students in a pleasant, bright classroom. Over the course of a year, we offer two types of courses, an "Introductory Course" and a "Master Course", for those who want to learn the fundamentals and applications of ceramics in earnest. In our classes, you choose from one of the three steps in pottery: "casting, painting, and glazing". Our unique 'One day pottery experience course' is popular. It is recommended for those who want to enjoy pottery in earnest, taking their time. We also offer visits to hole kilns. 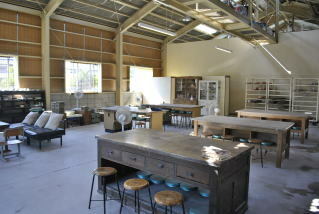 Modern ceramist Setsuro Shibata will instruct you in this cozy environment. You can enjoy working at your own pace from one day experience to a full course. We recommend our courses for those who are interested trying pottery freely, regardless of the form and color. We provide accommodation "HO-CA" from 2011, and it has proven popular not only among Japanese students, but also many visitors from overseas who come to spend time learning the craft of pottery. We provide guidance so that you can shop for food and bath in the close vicinity of our studio.